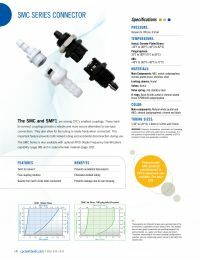 Colder SMC Series Couplings are designed with the latest Colder technology called Twist-to-Connect. The quarter-turn latch clicks to ensure that your connection is secure and allows tubing to rotate freely. SMC Series Couplings are among the smallest couplings offered by Colder and are constructed from a variety of different materials such as acetal, polypropylene, and ABS plastic.